Mothers, especially Indian mothers, tend to worry a lot. My own mother usually kicks off our phone conversations by asking, "Have you eaten yet?" But since I moved to New Delhi three weeks ago, she has adopted a new opening question: "Have you bought a mask?" This weekend, I finally relented and bought a face mask designed to protect against pollution particles. I did it for mom. But I also did it because Delhi's air has reached levels of toxicity that are putting my asthmatic lungs -- really anyone's lungs -- in serious danger. I wasn't the only Delhi-walla looking for protection. When I arrived at Nirvana Being, a small shop in the city's upscale Khan Market that sells anti-pollution products, there were at least 15 people in line to buy face masks. By the time I made my purchase, there were around 20 more. "When we opened that store people thought I was nuts," said Jai Dhar Gupta, who heads the store's parent company. "Now we have lines for 10 hours a day." 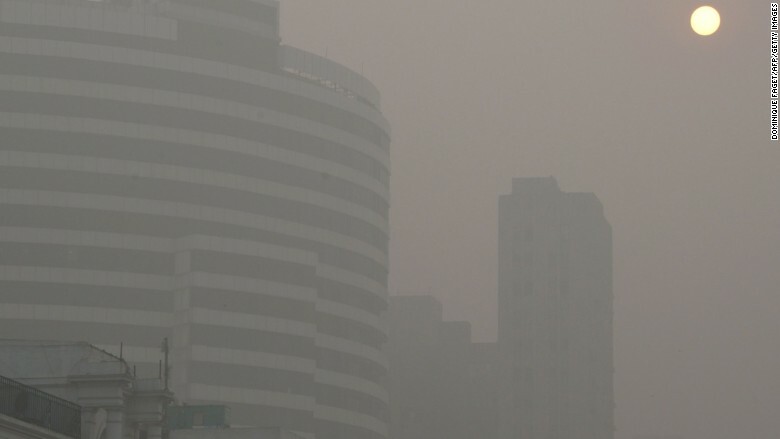 It's a scene playing out all over the city -- in pharmacies, electronics stores and anywhere else that sells masks and air filters that might provide relief. 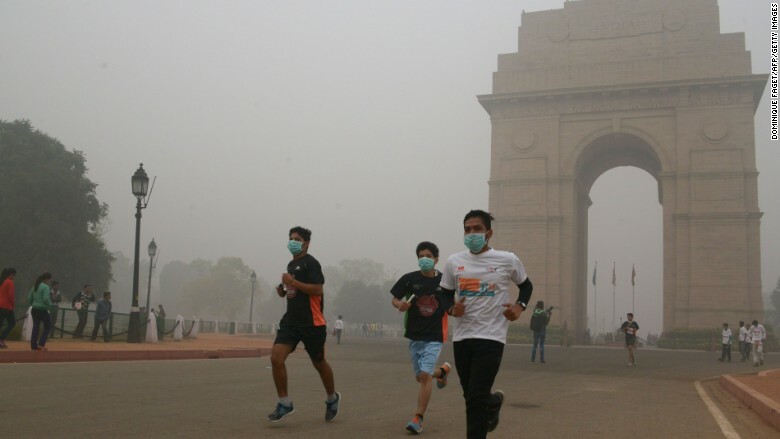 Runners brave high levels of air pollution this week in New Delhi. Already notorious because of its toxic air, pollution in Delhi has skyrocketed over the past week. Measurements of dangerous particles taken at the U.S. Embassy in Delhi put the city's Air Quality Index (AQI) at 999 on Monday, off the standard chart, which finishes at the "hazardous" level of 500. A blanket of thick smog has descended on New Delhi in recent days. "In all of October, we sold about 50 purifiers," said Jay Kannaiyan, the CEO of Smart Air Filters. "Within the first week of November, we've already sold 500." Kannaiyan apologized for not getting back to me sooner because his phone has been ringing off the hook. The low-cost masks that he sells for $1 to $3 are also flying off the shelves. In one three-month period last year, he sold 2,000 masks; last week he sold 5,000. Those who aren't standing in line are going online, with Amazon (AMZN) India confirming that it sold three times as many purifiers in October as it did in September, and four times as many compared to the same period last year. For masks, the demand is thirteen times what it was in 2015. Even if business is good for Kannaiyan and Gupta, they're not happy. Both say their main objective is the public good. 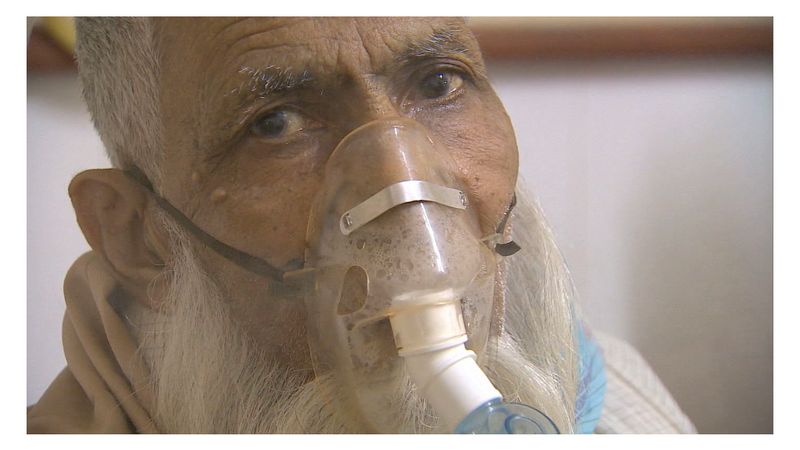 "I kind of feel like yelling at these people, because we've been telling you for ages that pollution is a problem in Delhi," said Kannaiyan. "No one's taking any action until it's so severe that now there's an emergency for everyone." 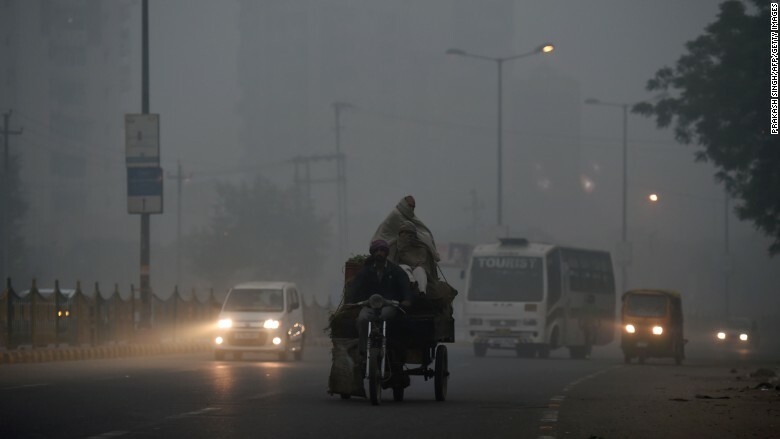 The Indian capital's excessive pollution has even caused accidents due to low visibility. Gupta, who says he's more activist than entrepreneur, bemoaned the "stubborn" and "reactive" political culture that has created the current situation. He said the government's emergency measures feel like far too little, far too late. "They need to call a curfew and get all the cars off the road," Gupta said. "Nobody knows that we're in a crisis." My mom, meanwhile, is glad I got my hands on a mask. But she hasn't stopped worrying.